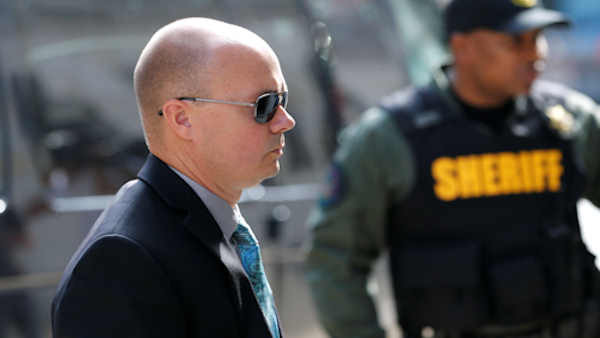 BALTIMORE -- A judge acquitted a Baltimore police officer of manslaughter and other charges Monday in the death of Freddie Gray, a black man who was critically injured in a police transport van. It was the fourth straight trial prosecutors have failed to win in the case. Lt. Brian Rice, the highest-ranking of six officers charged in the case, faced charges of involuntary manslaughter, reckless endangerment and misconduct in office. Williams previously dismissed a second-degree assault charge, and prosecutors dropped a second misconduct charge against the 42-year-old officer, who is white. Gray's death in 2015 became a rallying cry for the Black Lives Matter movement, fueling outrage nationwide over the treatment of black people by the criminal justice system. But it hasn't fit quite so neatly into the narrative of white authorities imposing unfair justice on minorities. In this case, not only the victim but the defendant, judge, top prosecutor and mayor are African-American. At the time of Gray's death, so was the police chief. In his verdict, Baltimore Circuit Court Judge Barry Williams said the failure to seat belt a detainee in a transport wagon is not inherently a crime, adding that the state failed to prove both that Rice was aware of his duty to seat belt Gray, and that he intentionally failed in that duty. "The state failed to show that the defendant, even if he was aware of the risk, consciously disregarded that risk," the judge said. Williams also said the state failed to show that Rice was aware of an updated policy that requires officers to buckle in prisoners. As a result, Williams said he operated under the impression that Rice was guided by a previous policy that allows for officer discretion when deciding when to belt. Gray was arrested after he ran from police officers in a high-crime area of the city. He was handcuffed and later shackled in the back of the police van, but officers did not ever buckle him in, which is the department's policy. Gray died a week after his arrest. Prosecutors had said Rice was most responsible of the six officers charged for following police procedures to fasten a prisoner in a seat belt, citing his 18 years of experience on the force. The officer's attorney said police could use discretion, if they believe their safety is at risk. Rice attorney Michael Belsky said officers had concerns, because Gray was not cooperative and they weren't sure what onlookers would do if extra time was taken to fasten Gray in the van. Prosecutors and defense attorneys gave different characterizations of the onlookers. Prosecutors described them as concerned observers, while Belsky said officers heard threatening comments during the arrest. Three of the charged officers are black, and three are white. Race has not been cited as a direct factor in Gray's death, but his arrest and fatal injury added momentum to the Black Lives Matter movement, which decries the treatment of black Americans by people in power. Baltimore State's Attorney Marilyn Mosby vowed to bring justice to an aggrieved citizenry when she announced the charges last year. But she has yet to find success in court, and is being sued for defamation by five of the officers. After four trials and no convictions, it's increasingly clear that the evidence against six Baltimore police officers in charged in Gray's death is too weak to sustain the hopes of citizens desperate for reform.